Whilst societies have flourished or collapsed according to their ability of dealing with climate variability and change it is only recently that we have acquired the ability to predict future environmental conditions. EUPORIAS, a project recently funded by the European commission under the 7th framework program, intends to improve our ability to maximise the societal benefit of these new technologies. Working in close relation with a number of European stakeholders this project want to develop a few fully working prototypes of climate services addressing the need of specific users. The time horizon is set between a month and a year ahead with the aim of extending it towards the more challenging decadal scale. Over the next 4 years the 24 project-partners, representing a diverse community ranging from UN organisations to small enterprises, will increase the resilience of the European Society to climate change by demonstrating how climate information can become directly usable by decision makers in different sectors. EUPORIAS is a four-year collaborative project funded by the European commission under the seventh framework programme. EUPORIAS commenced on 1 November 2012. The Euporias consortium is made up of 24 partners from across Europe and brings together a wide set of expertise from academia, the private sector and the national met services. Cofiño, A.S., et. al., 2017. The ECOMS User Data Gateway: Towards seasonal forecast data provision and research reproducibility in the era of Climate Services. Climate Services. doi:10.1016/j.cliser.2017.07.001.more info. The integration of seasonal predictions in different impact sectors such as agriculture, energy, hydrology and health require data from different sources, including observations, reanalysis and seasonal predictions/hindcasts from state-of-the-art forecasting systems used in EUPORIAS. The ECOMS User Data Gateway (ECOMS-UDG) was developed in the frame of the ECOMS initiative in order to circumvent all the problems associated with data harmonization, data access policies and complex file/data structures of seasonal forecasts. 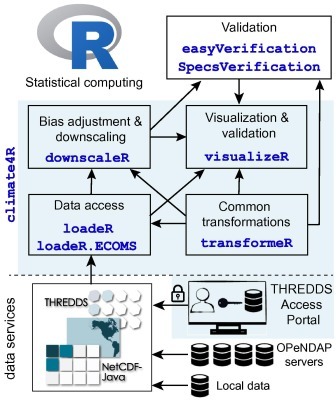 climate4R bundle is an open source, R-based interface for data access and postprocessing composed by a number of R packages implementing harmonized data access (one single vocabulary), data collocation, bias adjustment and downscaling and seasonal forecast verification and skill visualization. This provides a unique comprehensive framework for end-to-end applications of seasonal predictions, hence favoring the reproducibility of the ECOMS scientific outcomes, extensible to the whole scientific community. Bedia, J., Golding, N., Casanueva, A., Iturbide, M., Buontempo, C., Gutiérrez, J.M., 2017. Seasonal predictions of Fire Weather Index: Paving the way for their operational applicability in Mediterranean Europe. Climate Services. doi:10.1016/j.cliser.2017.04.001. more info. Ensemble Forecast Verification for Large Data Sets. Forecast Verification Routines for Ensemble Forecasts of Weather and Climate.